All I can say is that I’m late. I’m late for a very important date. Sorry I’m late. Have a wonderful birthday party K, and Cami and Mr Kaos. Those little cakes look fab. Oh, it’s looking lovely already. Have fun, and remember – it’ll be over in a few hours! OOH! Looks so fun! Have a great day…. Great job on the cakes NK! oh they look wonderful!If you pass the white rabbit, send him down the other hole! I don’t think he wants to stumble into a basement of sugared up little girls resembling Alice….Happy Day! By now you are probably passed out on the couch! I hope it was a great party! Hope the birthday girl enjoys her party! 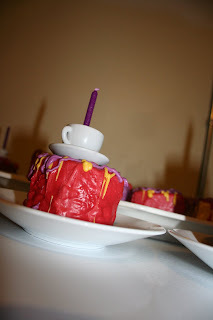 Jo: My mom made the cakes… she always does… I put the teacups on though ;)velma: when the party was over two of K’s friends stayed and played while their parent’s had drinks and relaxes with Mike and my mom and I. That was the best part.BW: We did… thank you sweetsdaddy: Aren’t they gorgeous? She really outdid herself this time.Mie: We gave him a mimosa… he was happy.missb: I wish I was. Instead it’s almost 10 at night and aside from eating dinner this is the first time I haven’t been on my feet. I am such a lazy bum usually that this is killing me.lindy: she told us it was her favorite one yet. i was even later. damn me all to hell. happy birthday little k! in my defense, i haven’t been on *any* blogs the last couple of days……really! Me loves the little K.So big now!!! !The cake is FABULOUS.